I’m sure everyone has heard of NuttZo, the multi nut butter. Not only does it have peanuts, it has cashews, almonds, hazelnuts, brazil nuts, sunflower seeds AND flaxseeds, all in one spread. I have seen that it’s very popular in bloggie world, so I was excited when the company sent me a jar of their organic nutty spread. 1. It provides 50% of your daily needs of ALA Omega 3 per serving with 650 mg.
4. This nut butter is actually stored upside down for easy stirring (it’s about time a nut butter company got smart!! 😉 ) All you have to do is open, stir and then refrigerate with the lid up (the words will be upside down). 5. NuttZo is also a sponsor/supporter or ProjectLeftBehind. Okay, so it has some awesome facts. But how does it taste? 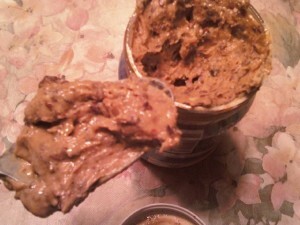 Well, if you like love nuts and seeds, you will like love this nut butter! Seriously- I opened up the jar, and there were TONS of nuts and seeds. Think of Skippy Chunky Peanut Butter- and then multiply by 5. You CANNOT get a tablespoon without a nut or a seed on it, ESPECIALLY flaxseeds. There are some serious flax seeds going on in this jar. look at all those nuts & seeds! Anywho- aside from the sort of offputting appearance (in my opinion, anyway), the taste really isn’t bad. It’s very crunchy (obviously), and has an almost buttery taste. THe most prominent nut flavor to me was the flax and hazelnut. I really didn’t taste any cashew or almond flavors, but it did have a wee bit of a peanut taste, that was slightly sweet due to the fact that they were Valencia Peanuts. 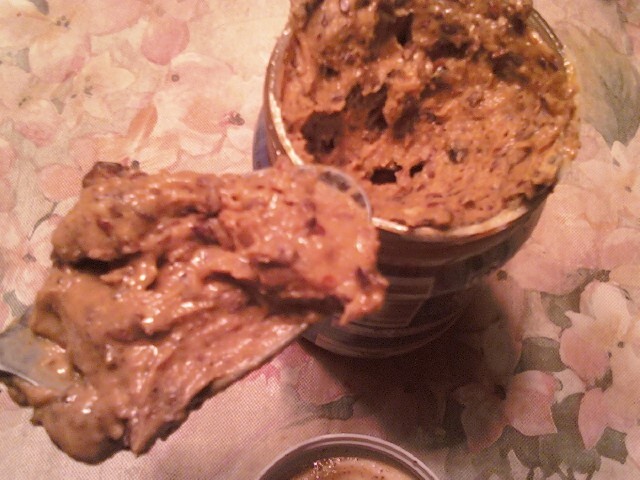 This nut spread certainly is satisfying, and you really only need 2 tbsp. in one sitting. I had mine straight out of the jar and on a piece of hearty whole grain bread, drizzled with honey. Since there is no sugar, it is a bit bland, so the honey played up the nutty taste quite well. Overall, I give this 3 stars for taste, and 4 1/2 for nutrition, so a total of 3 1/2 stars. While the nutrition is excellent, I wasn’t crazy about the numerous amounts of flaxseeds, and I’m not too fond of the taste of flaxseed as well. The crunchiness was nice, however, and it was certainly satisfying. I prefer my nut butters a bit sweeter, and creamier, but if you are a fan of crunchy of chunky nut butters- give this a shot!! Do you guys like NuttZo? What is your favorite way to eat it? 1 serving (2 Tbsp) is 180 calories, 16 grams of fat, 7 carbohydrates, 3 grams of fiber and 7 grams of protein. Organic Valencia Peanuts, Organic Flax Seeds, Organic Hazelnuts, Organic Cashews, Organic Almonds, Organic Brazil Nuts, Organic Sunflower Seeds, Sea Salt, Vitamin E, Natural Tocopherols.